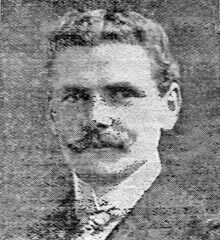 John Patrick Tohill was the eldest son of George and Jane Tohill. He was born on 1st June 1875 in Belfast. He was the eldest of at least six children. By 1881, the family had moved to Cookstown where John grew up. In January 1906, John was married. He and Henrietta had two children. He was in business with his brother-in-law in the motor and cycle trade. At the outbreak of war he offered his services as a despatch rider but wasn’t accepted. John then volunteered for motor transport work with the Royal Army Service Corps. 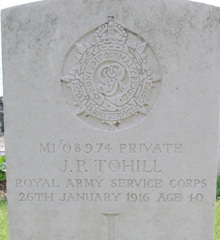 Private Tohill was serving with the Army Service Corps and was attached to the 179th Tunneling Company of the Royal Engineers in France when he was killed by shell fire on Wednesday 26th January 1916.